That is adorable…and a cool tradition! Hopefully you’ll have a tumbleweed blow by every year at Christmastime. That is very cool. Merry Christmas, Matthew and family!! You have a kickbutt 2010 too, you deserve it. 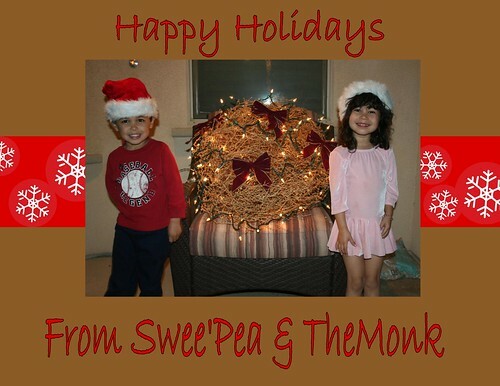 The kids look great with the tumbleweed! When you said you surprised the kids with a NATURAL Christmas tree this year, I certainly didn’t think of a tumbleweed. I have never seen a tumbleweed! I had no idea they looked like…that. I thought it would be more see through. Or something. Mail it to Memphis????? You don’t miss a trick, do you? Too freaking cute. Hahahaha, you’re the best. I live in the darn desert and I rarely see tumbleweeds, so it was obviously meant to be!